An absolute winner at this price. A little bit more punch from the low E would be nice. We all know what Gretsch is about, right? Big-bodied, feedback-prone twang machines with Bigsby tremolos. Some of us might even know that Gretsch’s Broadcaster drum set forced Leo Fender to change his first guitar’s name to Telecaster. The reality is, however, that the Gretsch pedigree goes a long way back to 1883, when the company made drums, tambourines and banjos. Gretsch started making guitars in the 1930s and has since maintained its reputation for quality. 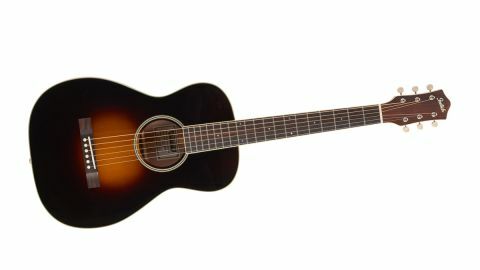 The snappily titled G9511 Style 1 Single-0 Parlour comes from the Asian-built Roots series, guitars described as being ‘inspired by tradition’. In other words, they look old-timey. The range includes guitars, banjos, ukuleles, resonators and mandolins, and in the world of guitars, ‘old-timey’ means 12th-fret-to-body joins, vintage looking sunburst finishes and open back tuners. The parlour guitar we’re reviewing here is joined in the Roots series by double and treble 0 styles, an archtop with a pickup, and a Jim Dandy short-scale parlour model reminiscent of catalogue guitars from the likes of Sears. Make no bones about it, we love the way this little guitar looks. Straight out of the box it won us over, which is rare for a jaded old hack who see guitars come and go every week, and still more so for a guitar with such a low price. The truth is that guitars like this and Fender’s Paramount parlour are designed to look like 1930s Gibsons, rather than being based on real historical models from those brands. The G9511’s top is solid spruce and doesn’t look to be the most finely grained in the visible area, which is small because this guitar has the darkest and most pronounced sunburst finish we have ever seen. Gretsch calls it Appalachian Cloudburst. Essentially it’s black at the extremities, fading to a small patch of honey just below the soundhole. It looks classy, and again pays homage to Gibsons of the 1930s. The rosette and top binding match, striped black and aged white, which, in low light, looks almost maple. The back and sides are laminate with a mahogany veneer (rather refreshingly, Gretsch openly states this on its website), and there’s a centre stripe and heel plate to match the aged white of the binding. The 19-fret, 24.75” scale mahogany neck has a fingerboard radius of 12.6”, which feels subjectively very flat. It’s bound once more in aged white plastic, the rosewood fingerboard carrying very small and classy looking, diamond shaped mother of pearl inlays and a bone nut. Gretsch describes the neck as a soft V profile, but sadly it isn’t (a rare disappointment on this guitar, as we love a V profile). It’s actually a slim, modern C.
At the other end there’s a rosewood bridge, a simple rectangle in keeping with the cool 1930s vibe, and a compensated saddle of indeterminate material; we might assume it to be bone, based on the nut, but Gretsch doesn’t say. The headstock is also bound, and faced in rosewood, with an unostentatious Gretsch logo that looks silk-screened. There’s also six simple open gear tuners with aged white knobs to match the binding. These are perfectly smooth and useable, though regular oiling is a good idea to stop them binding, as dust and perhaps corrosion may build up on them. Overall, the G9511 looks fantastic - there’s no question about it. The 12-fret-to-body join and the finish make the body look unusually long, but in no way clumsy, and somehow the high gloss finish really compliments the vintage look. In fact, it looks as though it’s lived inside a sepia-toned photograph and, as if by magic, we were able to pull it out and play it. With this guitar, it’s easy to imagine yourself perched in a box car, picking the miles away across the vast acreage of America, or equally in a nice suit and sharp hat playing the blues in every town you travel to. Quality wise, this guitar is perfect - no fret problems, nothing poorly executed, and there’s perfect intonation across the board. Looks aside, how does it sound? First of all, it’s very light. If you’re used to a big guitar, or even a parlour with a pickup and preamp, the G9511 will give you a barely-there feeling. While comparators weren’t available, the G9511 felt unusually light in the hand, even for an acoustic-only parlour guitar. The small, fairly shallow (though far from thinline) body is easy to cradle, making this a guitar you can play wherever you happen to be, whether that’s curled in a recliner or laid back in a lawn chair. The action is low and sweet; we sincerely hope that every G9511 is this good out of the box, because it’s far better set-up than many guitars we’ve received for review. The slim C neck profile detracts from the vintage experience somewhat, but it will be comfortable and welcoming to most people, even if a nice hard V would have stood out more. That and the flat fingerboard radius allows for quick playing if that’s your bag, and you can bend the string a long way without choking, if that’s how you would use a guitar like this. Tone wise the G9511 is wonderful; airy, bright and sparkling, without any of the harshness you might expect from a spruce and laminate combination. Make no mistake, this is a relatively trebly guitar and the low E string in particular is positively quiet, but that’s no bad thing. After all, why would you want your parlour guitar to sound like your dreadnought? And if it could sound that way, why would the dreadnought have been created? There’s a complexity and sparkle to the high end that you only get with a good spruce top, and the light construction must help a good deal, too. on open chords reveals a little warmth to complement the sparkle, while the low E is notably quiet - perhaps a different string set to the supplied D’Addarios would get a stronger bass response. The guitar plays well up and down the neck, as befits the flat radius and superb set-up, though of course the lack of cutaway and 12-fret-to-body join limits accessibility a tad to the dusty end. What’s truly impressive are the dynamics. When played hard, the Gretsch is really loud, though not bassy. Back off a touch and it has a sweet indoor voice. With pick or fingers, the sparkle is evident. However, you may find that pieces which rely on movements in the bass to hold the ear may require you to play harder than you are accustomed to. This shouldn’t be interpreted as a problem, though. Fingerstyle is predictably pretty and you won’t feel restricted to open chords either; the scale is not that short, but somehow moving up the fingerboard feels easier than on larger bodied guitars. When strumming with fingers the tone remains bright and light, but with surprising projection. Pick up a plectrum and you might expect some harshness or overdirect tone, but there’s not one bit of it. The louder we get, the brighter it gets, with the tone remaining like being brushed with a fairy’s wing rather than being jabbed with an ice pick. Couple that with the extraordinary playability and you have a very serious contender here. Overall, the Gretsch G9511 is a great guitar at a bargain price. It would be easy to act snobbish about the laminate back and sides and the Asian origin, but don’t be. Instead, try this guitar for yourself and you’ll find it better than many of the more expensive guitars, even some of those with all-solid woods. It’s not really a stage guitar - Gillian Welch and David Rawlings may do without pickups, but they have nice condenser mics and good sound people - so this Gretsch is unlikely to cut it for most pub gigs. It is instead a guitar for your home. The dinky size and great tone at low volumes makes it an ideal guitar for front room strumming and picking. If played harder, the volume is ample to make it heard at the beach, in the garden, or round the kitchen table with your bandmates, showing off that new song you’ve written. Truthfully, if the G9511 had a V profile neck you’d have to pry it from our hands with a crowbar. If you want an acoustic-only parlour, you owe it to yourself to try this one.